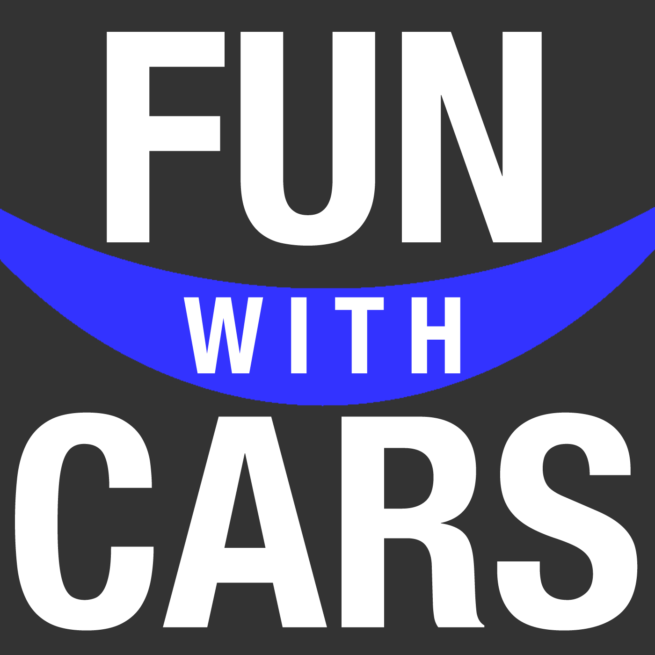 The Detroit Auto Show, known officially as the North American International Auto Show or NAIAS, featured the usual plethora of new car launches, concept cars, and general self-promotion from the worlds car companies. Fortunately, this usually includes displaying race cars from various series that manufacturers compete in. This year, Indycar also set up a stand and showed some of its best material. 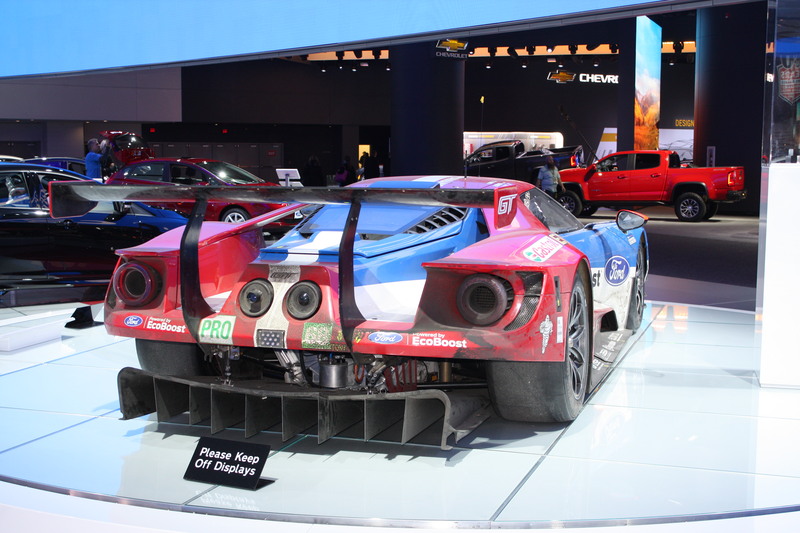 Here are the most notable racing items on display at NAIAS. 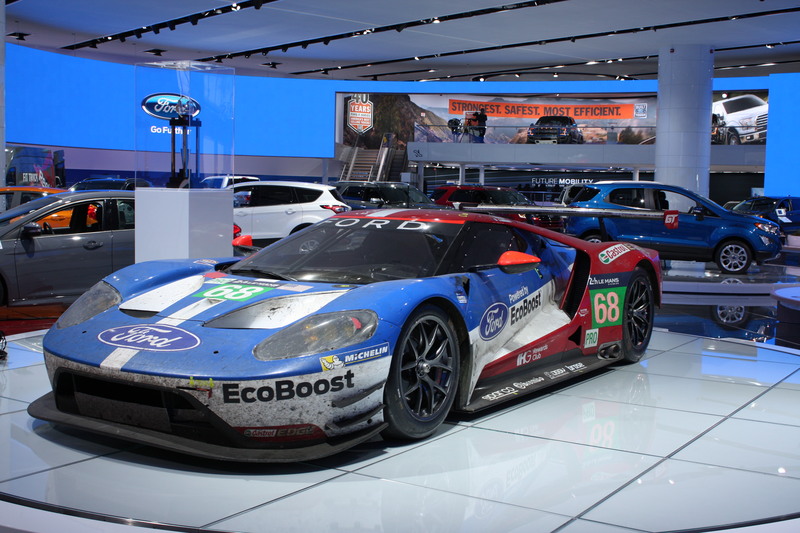 The LM GTE Pro class winning Ford GT race car. Ford rightly concluded the best possible way to celebrate the 50th anniversary of it’s Le Mans victory in 1966 was to win again. 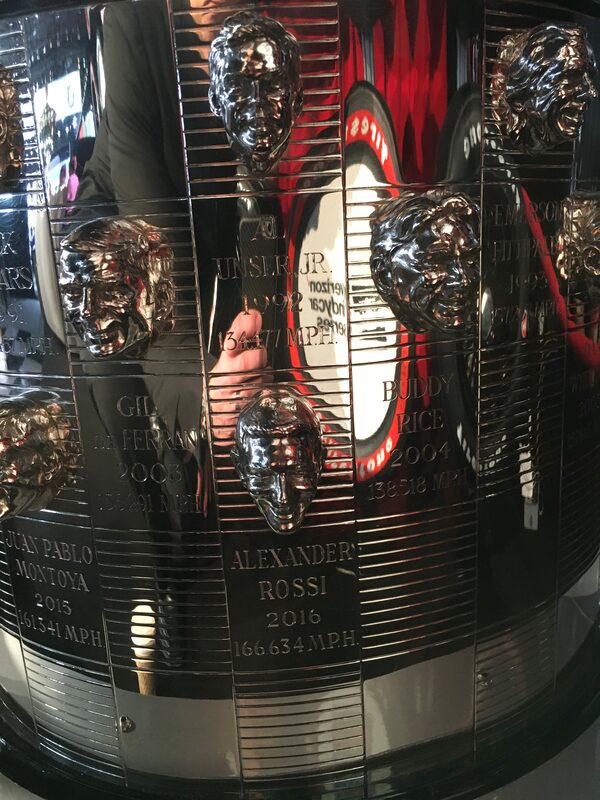 They did so with the help of Chip Ganassi and this, the 68 car driven by Sebastian Bourdais, Joey Hand, and Dirk Muller. For authenticity, they left the car raw. All the dirt, damage, and glory of the moment remain. Beautiful. 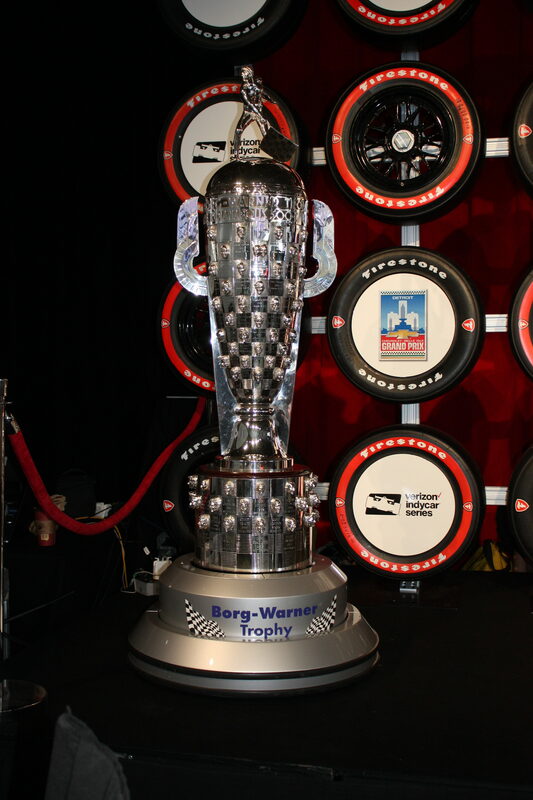 The iconic Borg Warner Trophy. This is it. The actual trophy, with the names and faces of the winners imprinted around its circumference. Look closely and young American, and F1 veteran, Alexander Rossi, smiles proudly at the bottom. 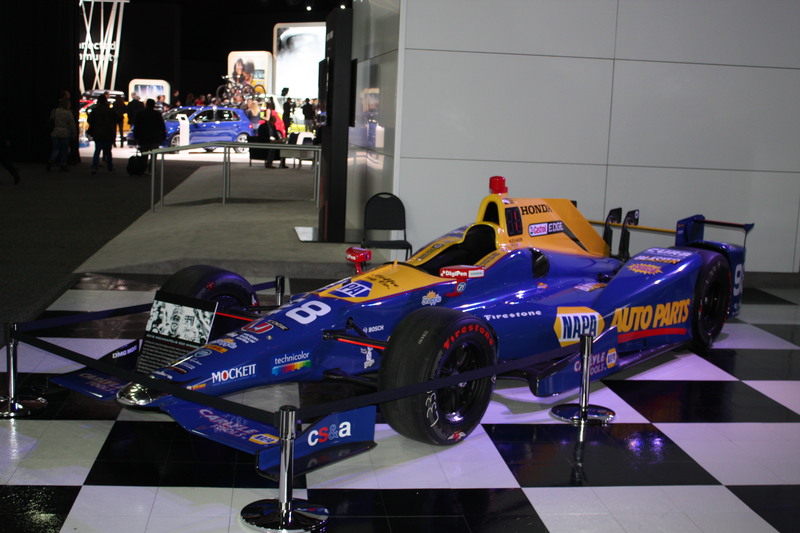 Rossi’s Indianapolis 500 winning car also came to the show. Take a close look at the car. Notice the trimmed-out aero in hopes to make the car slip through air as easily as possible, with just enough downforce to keep your foot flat. 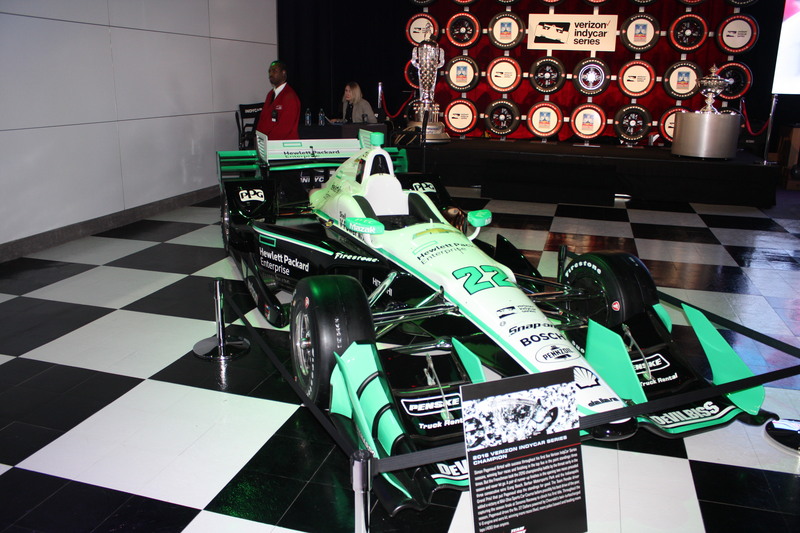 Indycar also brought along Simon Pagenaud’s championship winning car. He clinched it at Sonoma Raceway in California, a road course. See the difference? Another 1000 pounds of downforce, perhaps? Mercedes also mounted an F1 car to the wall of its stand, but that’s become rote for them and, yes, we know it’s a winning car, and, yes, rah rah, look at how fast it is. But that’s a display car, nothing more. The cars you see here were the very machines that did the work. Great to see. That’s the most defeated, and gracious, I’ve encountered Lewis Hamilton when asked about relative performance to his teammate this season, if not ever. And he’s right, with four races and only 100 more points available in 2016, Rosberg holds a formidable margin and the momentum. After Italy, Hamilton lead by two points. 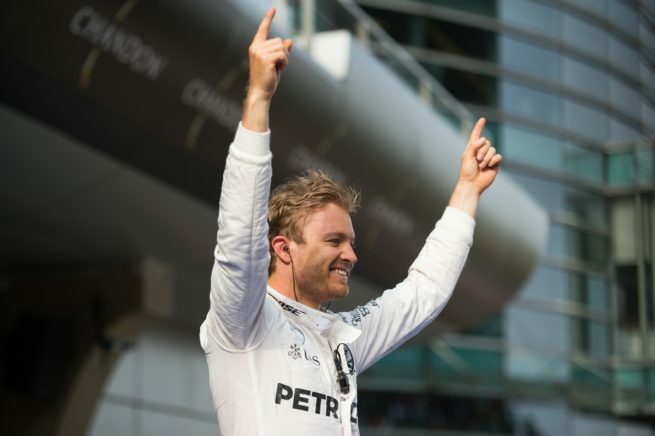 In the following three races, he scored 30-points, Rosberg collected 65. Rosberg won more times this season as well, a tiebreaker would currently fall the German’s way. Hamilton then has to score 34 more points than Rosberg. Or an average of 8.5 more points per race for the remaining races. 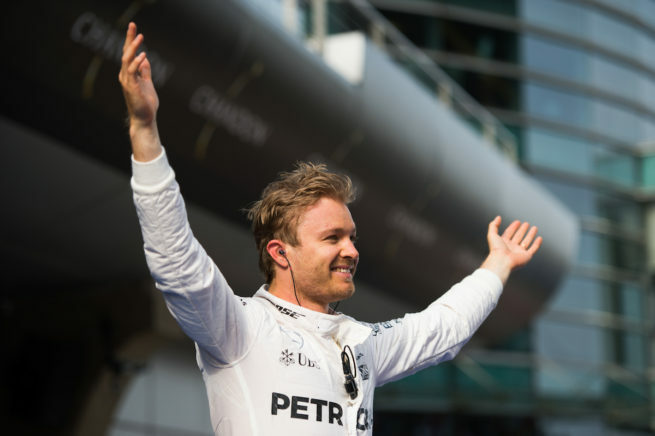 Critically, even if Hamilton wins the next four in a row, Rosberg can hold the title with four second-place finishes. But certainly do not count Hamilton out. 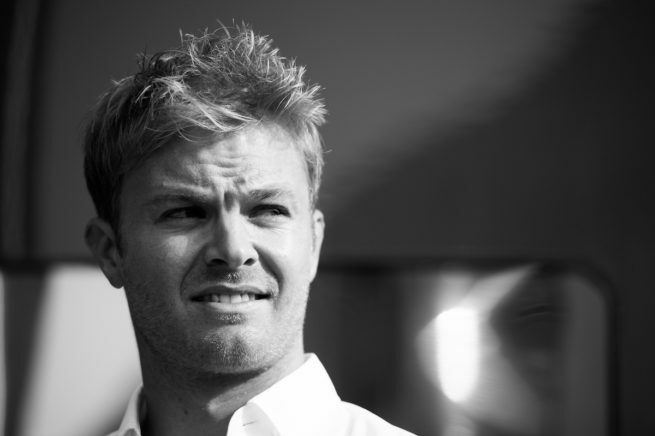 Rosberg once lead Hamilton by 43 points. Hamilton went on to win six of the next seven Grands Prix and put Rosberg 19 points in the hole. But, frankly, I’ve never seen Rosberg drive so well and while Hamilton certainly suffered more points-robbing bad luck, the last few races Rosberg beat Hamilton with pace. It’s pretty much been a head-to-head race for the title since 2014, but this year could prove the most exciting fight yet. And maybe, just maybe, the 2017 rule changes will allow another team to challenge. The other underdog strong performance came from Force India. They now hold a 10-point gap in the Constructor’s title over Williams, making fourth place seem possible and approaching likely. In Malaysia and Japan both Hulkenberg and Perez scored points, Perez heading the charge. McLaren didn’t fare to well in the Japanese Grand Prix, Honda’s home race, but they didn’t expect to either. For whatever reason, Suzuka exacerbates the McLaren’s weaknesses, not strengths. It’s an ironic anomaly in an otherwise encouraging second half of the season. In Malaysia, McLaren earned a double points finish and they now enjoy a solid 15 point lead over Toro Rosso, sixth in the Constructor’s championship is likely. For the remainder of the season, all eyes will stay focused on Mercedes’, they clinched both the Constructor’s and Driver’s Championship in Japan, now it’s just a matter of which driver. So said Jenson Button to Formula 1 News after carrying through to Q3 and, with just one run, qualifying 9th for the Malaysian Grand Prix. That in of itself is not that big of a deal, but this is Button’s 300th grand prix, which puts him behind Rubens Barrichello and Michael Schumacher and no one else in number of race starts. 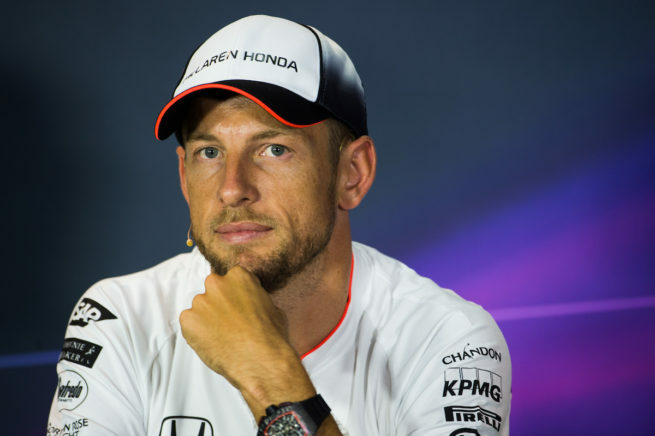 Tomorrow Button becomes just the third driver in history to achieve such longevity. In fact, his teammate Fernando Alonso is 4th on the list, 32 grands prix behind. McLaren does not currently build quickest chassis nor does Honda manufacture the strong power unit, so Button’s performance deserves accolades. Even more exciting, Button goes on to say that he thinks he can stay ahead of both Williams and race the folks around him, so perhaps he’ll also finish in the top ten. Finishing in the points would be a well-deserved feather to put in his 300-grand-prix-hat. Button qualified behind both Force India’s. Perez led in 7th, Hulkenberg right behind in 8th. 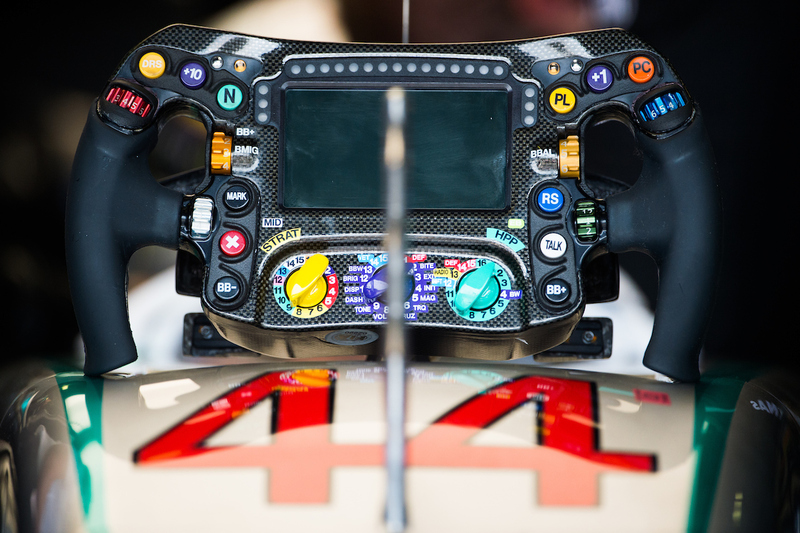 That means Force India has a Button buffer between them and their closest Constructor championship rival, Williams. Force India is currently ahead by one point, but they now have a chance to widen the gap and tighten their grip on 4th, an admirable feat for the small, Silverstone based team. Further ahead, Hamilton got serious and once again handily out-qualified teammate Nico Rosberg. But, as Rosberg said in the post qualy press conference. “As we know from this year, second place doesn’t mean that victory is not possible tomorrow. We’ve seen that so many times. Still very optimistic for tomorrow. 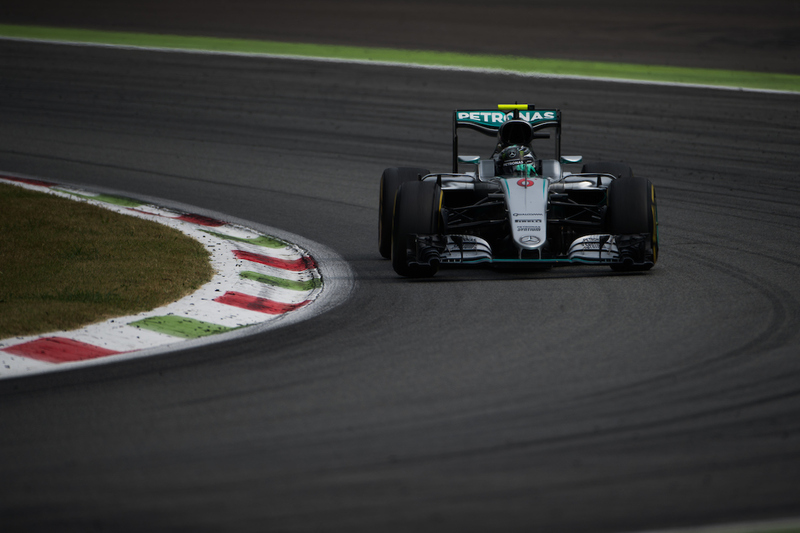 “ It’s generally advantage Rosberg on race start, he proved it recently in Italy. One key difference I see, however, Hamilton seems laser focused and serious this weekend. I find it harder to forecast a flubbed start. No matter, even if both Mercedes nail their starts and sail off ahead from the competition, we’ll get to see Ferrari and Red Bull duke it out for the final spot on the podium. Red Bull Racing starts ahead, but Ferrari may have an advantage on race pace and strategy. Definitely one to watch tomorrow. 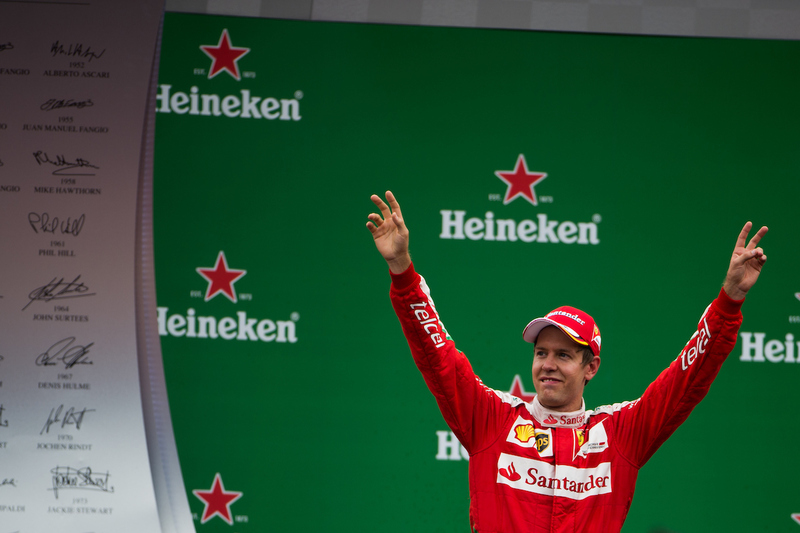 “… First of all, big congratulations to Nico, he drove fantastically well all weekend and fully deserved the win. Very tough day today, as always it is here in Singapore. This weekend has just been a bot of a tricky one for me, but I’m still glad I could get back up on the podium and get some points for the team.” So said Lewis Hamilton on the podium after the Singapore Grand Prix. He so rarely tips his hat to his teammate I rewound the coverage and watched again. Then I read the press conference transcript and checked a third time. That’s how well Rosberg performed in Singapore. In qualifying he wedged half a second between his pole time and Hamilton’s P3 lap. The race start gods answered the German’s prayers and he launched the car flawlessly, leaving no gap for the ever-aggressive Ricciadro to try and fill. Rosberg went on to maintain a solid gap throughout the grand prix whilst keeping the brakes from their melting point, if only just. Red Bull applied clever strategy and Ricciardo again went on the Mercedes hunt in the closing stages of the race, yet again Rosberg answered and picked up the pace just enough to keep the energy drink emblazoned car behind. Claire Williams no doubt focused on points. In Singapore, her team earned none while Force India grabbed four, which means Williams fell behind in the Constructor’s Championship by one, now 5th. Certainly a street course adorned with 23 corners does not suit the slippery and downforce deficient chassis. But name a course remaining on the calendar that does? And perhaps the one person happier than Rosberg is Daniil Kyvat. After his demotion to Toro Rosso, the Russian drove deeper and deeper into despair. One bad result followed another, his new teammate, Carlos Sainz Jr., handily outperforming him. In Singapore, Kvyat turned a corner. His moment of redemption came when he successfully held off his seat stealing nemesis, Max Verstappen, for several laps. Verstappen started poorly, but quickly caught Kvyat. The two got very close, Verstappen definitely tried many different attempts, some of them a bit dicey, but Kvyat defended admirably and, mercifully, no team orders came to force the pass. Those several laps flooded Kvyat with much needed confidence. He went on to finish ninth, his best since switching to Toro Rosso and well ahead of his teammate. Afterwards he announced to the media that his passion was back. Our passion to see it again in Malaysia is back too. When the circus finished their last Saturday in Europe at the Italian Grand Prix, Lewis Hamilton looked unstoppable with a decisive pole lap, clearing teammate Rosberg by nearly half a second. One bad start from Hamilton on Sunday, however, flipped the script and Rosberg took the win and gained seven points on Hamilton. Here we are, two weeks later, and a near exact mirrored result reflects on Rosberg. He performed brilliantly today and claimed pole by over half a second. Even better for the German, it’s not his teammate sharing the front row. Daniel Ricciardo split the Mercedes with a stonking lap in the Red Bull. 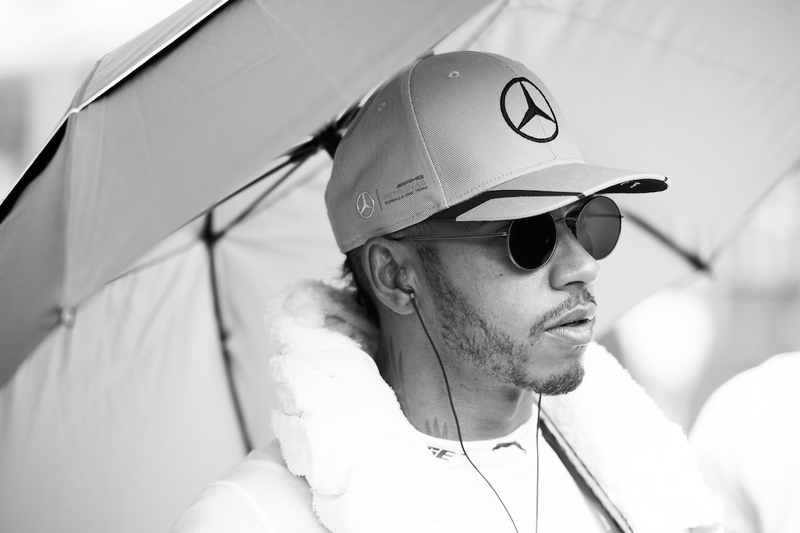 Hamilton finished Saturday P3, over seven-tenths behind. But, and this is a big but, both Rosberg and Hamilton have botched starts this season. And looking in the mirror shows us it’s Rosberg’s turn to have trouble when the lights go out. Rosberg fans can only hope the German immediately dropped to his knees, clasped his hands together, and prayed most passionately to the race start god. Ask the race start god for strong clutch-bite, smooth torque modulation, and minimal tire spin. Beg for quick reaction time, or at least quicker than those around you. Ask for the strength to keep your eyes on turn-one and your mind on the exact start procedure given to you by Mercedes engineers. Rosberg, this is your chance to regain the championship lead. Don’t blow it! Speaking of championships, both Force India cars qualified ahead of both Williams. Williams currently is ahead of Force India by two, itty-bitty points. So a strong performance by either Hulkenberg or Perez may catapult the team right back to fourth in the constructors championship, a position they grabbed after Belgium and immediately lost it again in Italy. In a surprise show of form, Toro Rosso qualified ahead both the aforementioned teams, Carlos Sainz in 6th and Daniil Kvyat in 7th. That tells us the chassis is held back the year-old Ferrari power unit. The Italian team currently stands in 7th in the constructors, 3 points behind McLaren. A strong performance could move them up. Singapore is full of what ifs, a lot of possibilities, and a decent number of potential shake-ups. Let’s not forget that Vettel starts from the back and Red Bull has its best chance of the year to steal another victory from Mercedes. Jamey Price always shoots with his soul. I know it because the emotion of the moment comes through beautifully in every image. Put him in a place chock full of passion and excitement and the resultant pictures are simply stunning. 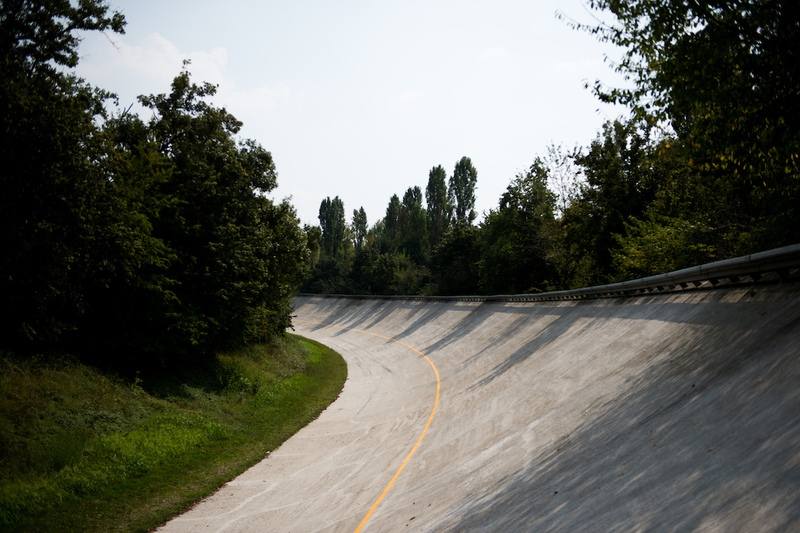 Monza and it’s original banked oval. We’ve all seen it, yet it’s a sight to behold every time. The shade of neighboring trees cast their shadow on the otherwise barren concrete. It’s in stark contrast to the age of cigar shaped 160mph rockets blasting by. Memories. 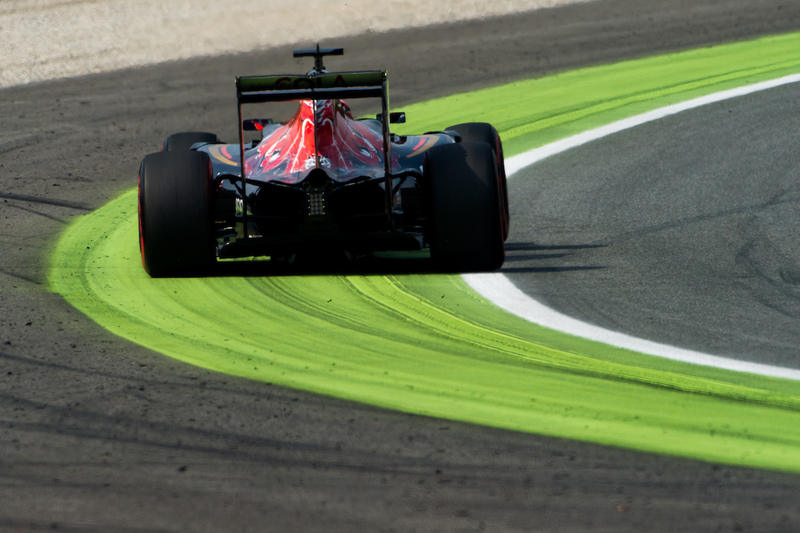 Daniil Kvyat running nearly a car width past the “track limits” of Parabolica. You know, not that long ago Kvyat would’ve been skating off in the grass. Is this real progress? Safer, maybe. But definitely not the same challenge to nail the throttle early while exiting this fast increasing radius corner. 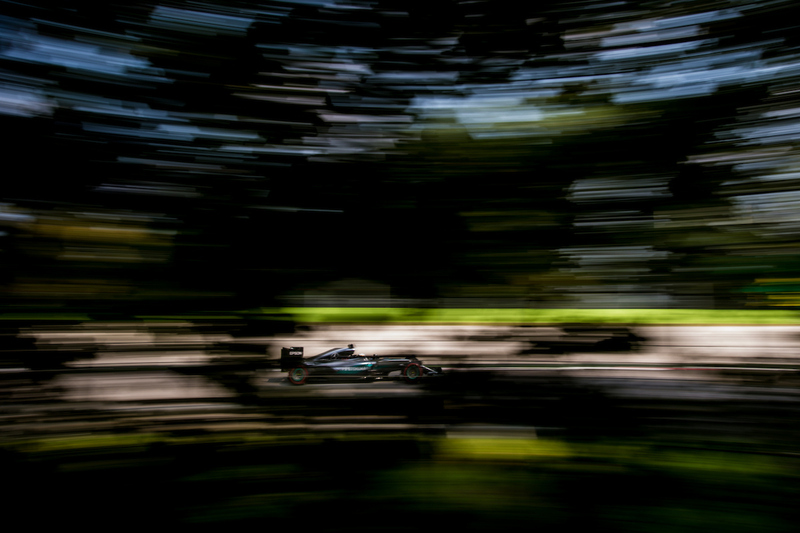 Focusing on Mercedes does put everything else in a blur. According to Jamey, they look incredibly planted compared to the rest. Around Monza, that’s crucial. The lap times prove it. When Hamilton’s hands touch that wheel, the results devastate the competition. 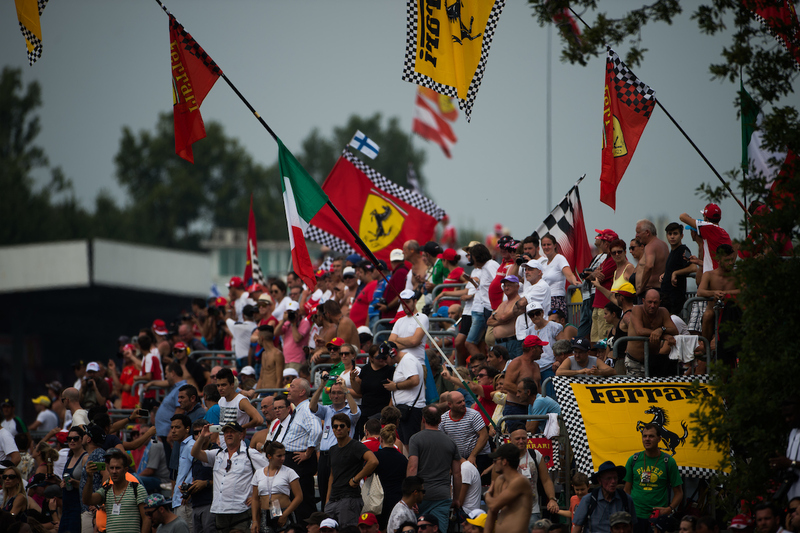 He lapped Monza half a second quicker than Rosberg and third quickest Vettel by nearly nine-tenths. Race day. 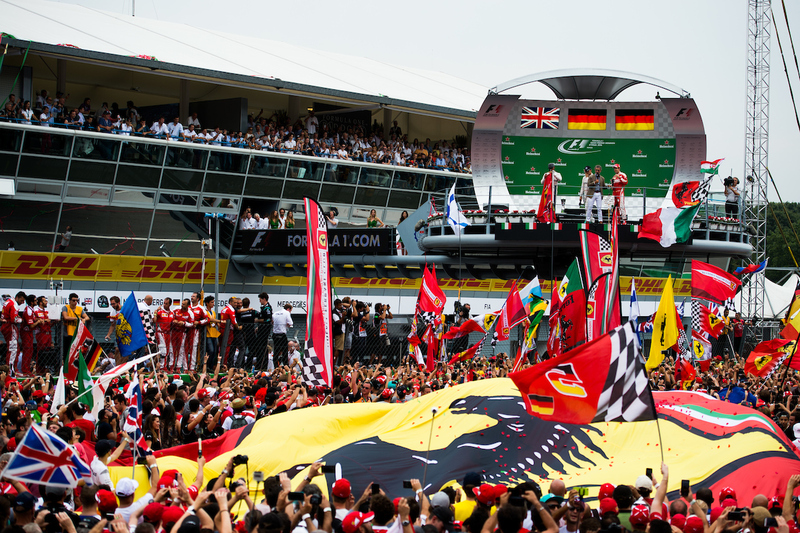 No grand prix comes remotely close to the passion seen in Italy, where nearly everyone bleeds Ferrari red. By the way, is that a Finnish flag I see waving atop the prancing horse? Nice. It’s easy to say in hindsight, but Hamilton looks to lack the intense focus you imagine a driver needs when preparing for the race start. Rosberg, on the other hand, stayed focused, nailed the start and put on a clinic. Unlike 2014, he kept his wits and didn’t give Hamilton any chance to steal away this race result. The Italians didn’t care. 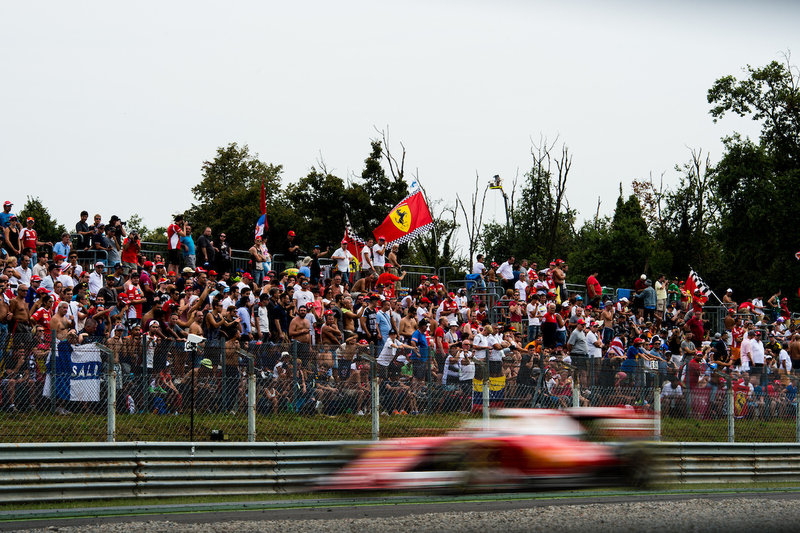 Look at the near homogeneous Ferrari red in the stands. That image is mirrored at every grandstand. Look at the attention. It’s Ferrari or nothing. Jamey Price captured the entire grand prix in this shot. 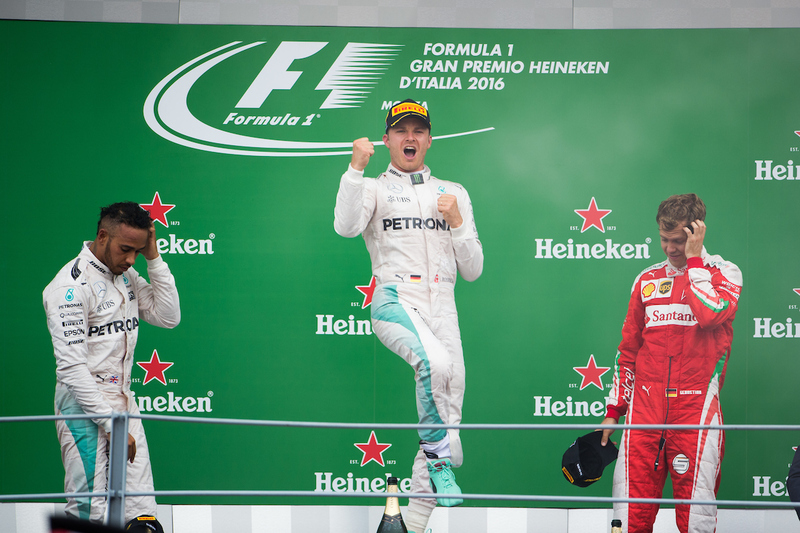 You can see the elation in Rosberg, the disgust in Hamilton, and the bewilderment in Vettel. How will Ferrari catch Mercedes? It’s a head scratcher. Vettel feels the love. And it shows. In Italy, it is Ferrari. If you are part of it, you are a hero.